Motherwell could be forced to seek a postponement of Saturday’s clash with Aberdeen due to an illness which has swept through the squad. The bug forced the club’s Fir Park ground to be shut earlier in the week to prevent the bug spreading further. Tuesday’s under-20 match with Celtic was called off because of the number of younger players suffering from the virus but a number of first-team players have also been showing symptoms. Manager Mark McGhee had only 15 outfield players available to train on Tuesday - and the ’Well boss said that if his squad is depleted any further an appeal may have to be made to the SPFL to call off Saturday’s home match with the title-chasing Dons. 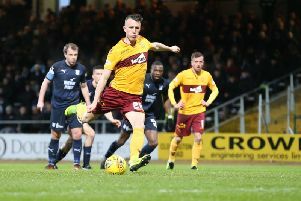 McGhee said: “At the moment our count seems to be about 15 which includes two or three of the young boys who have never been involved at first-team level. McGhee already had Stephen Pearson ruled out with a punctured lung and broken ribs with Louis Laing (groin) still missing and Keith Lasley a major doubt with a dead leg. He said; “Of the team who have been starting of late, we have probably got about six training this morning. “But if I have nine or 10 of the ones that have been playing every week, then I will be quite content to go into the game. I don’t want to go in with six though. “If we had another three or four showing these symptoms and unable to train, then it would leave me with no choice. McGhee said he had never experienced such a sweeping illness problem in all his years in football. He said: “I have had little bouts where a few people have the flu but I’ve never seen this where everybody is wiped out. “I have a bit of a cold but it’s not what they have. It’s quite deep set, coughing, spluttering, temperature, fever and all that sort of thing. But McGhee is concerned about the impact on not just his own team but the title race itself given the Dons are one point behind Ladbrokes Premiership leaders Celtic, who visit Fir Park on April 9. The former Aberdeen and Celtic striker said: “It’s made for a great game because we are one of the form teams, we have won four out of five, and want to maintain that run. “If we end up in the bottom six we want as big a cushion as we can, and if we can do better than that, that would be fantastic. So we want as strong a team as possible out there. “We also have a responsibility to the competition. We’ve still got Celtic to play, so I don’t particularly want to go into the Aberdeen game with half a team and then have my full team out against Celtic.